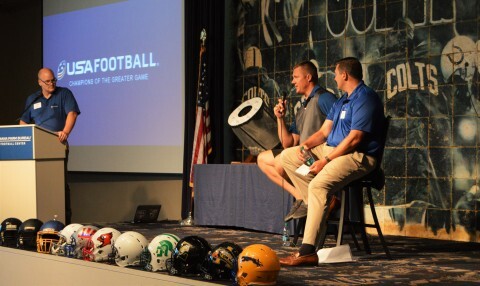 UnitedHealthcare’s Mike Merk moderates a mini panel discussion with Colts’ former offensive lineman Ryan Diem and UnitedHealthcare’s John Lurker at an exclusive event focused on student-athlete health and safety. The event was the culmination of the inaugural HELMETs sweepstakes, a collaboration between the Indianapolis Colts and UnitedHealthcare to enhance health and safety of young athletes through proper equipment, education and training (Photo: Ana Kavanaugh). 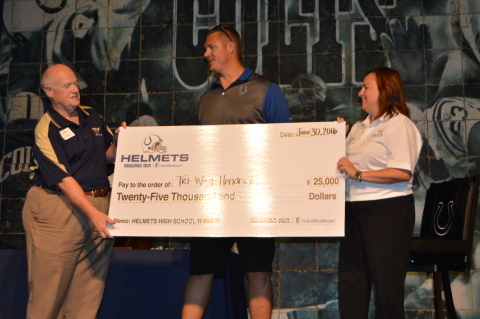 Representing Tri-West Hendricks High School, North West Hendricks School Corporation Superintendent Rusty King accepts the HELMETs grand prize check to purchase new 5-star helmets for the school’s varsity football program (valued at $25,000) from former Indianapolis Colts’ offensive lineman Ryan Diem and UnitedHealthcare’s Liz Drury. The check presentation was part of an exclusive event focused on student-athlete health and safety. The event was the culmination of the inaugural HELMETs sweepstakes, a collaboration between the Indianapolis Colts and UnitedHealthcare to enhance health and safety of young athletes through proper equipment, education and training (Photo: Ana Kavanaugh). INDIANAPOLIS--(BUSINESS WIRE)--Today 18 Indiana high-school football programs were hosted at the Indianapolis Colts’ headquarters at an exclusive event focused on student-athlete health and safety. The event was the culmination of the inaugural HELMETs sweepstakes, a collaboration between the Indianapolis Colts and UnitedHealthcare to enhance health and safety of young athletes through proper equipment, education and training. Select players, coaches and school administrators from each school attended the event, which featured remarks from guest speaker and former Colts offensive lineman Ryan Diem and a Heads Up Football™ clinic conducted by USA Football; and concluded with an awards ceremony at which Tri-West Hendricks High School was selected at random to win the HELMETs grand prize of new 5-star helmets for the school’s varsity football program (valued at $25,000). The 17 remaining finalists each received a $1,000 donation to the school’s athletic department. UnitedHealthcare serves nearly 870,000 people in Indiana with a network of 170 hospitals and nearly 21,000 physicians and other care providers statewide. Today 18 Indiana high-school football programs were hosted at the Indianapolis Colts’ headquarters at an exclusive event focused on student-athlete health and safety.